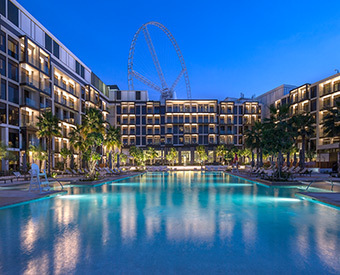 After opening its doors in November 2018, Caesars Bluewaters Dubai has welcomed a host of guests to its luxurious hotel in the Middle East’s flashy city. A world away from the brands’ flagship resort in Las Vegas, its new Dubai venture doesn’t have a gladiator fountain or marble column in sight. 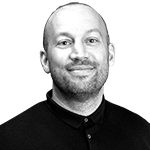 Instead, décor is slick, modern and boasts a contemporary luxury that fits perfectly with the emirate’s fashionable hotel ethos, however an underlying nod to the Roman era is evident throughout. 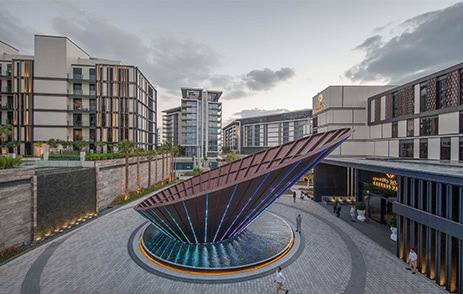 Located on Bluewaters, the city’s newest island oasis, Caesars Bluewaters Dubai is surrounded by 200 retail, dining and entertainment outlets. Yet the island, which is within walking distance from The Beach on JBR, is dominated by the city’s latest skyline addition: Ain Dubai. Once operating in late 2019, this masterpiece will take top billing as the largest observation wheel in the world, a crown it’s set to steal from Sin City’s High Roller (another arm to the Caesars Entertainment brand). 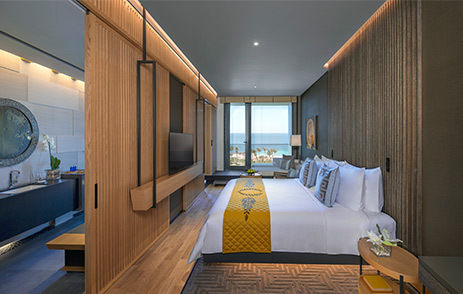 Surrounded by the twinkling water of the Persian Gulf and with its own private beach, Bluewaters is tipped to be a popular destination for visitors to the city, and with Caesars Bluewaters Dubai being the only hotel on the island, it’s bound to get booked up fast. 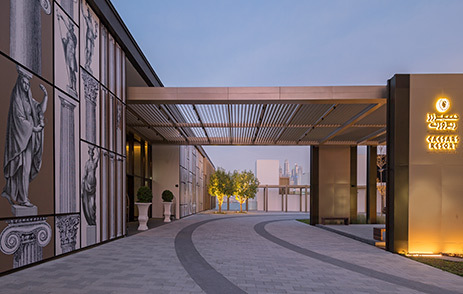 Its low-rise exterior is etched with ancient Roman sketches of columns and is set against the mind-bending Dubai skyline. Inside, the décor is the brainchild of modern American interior designer Jonathan Adler, and it oozes sophistication. 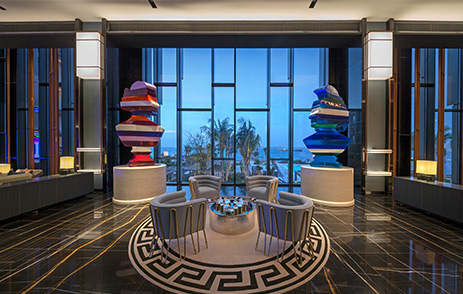 From the black marble flooring of the reception through to the candy-striped, distorted sculptures in the lobby of Caesars Resort Bluewaters Dubai, every corner has been carefully planned with an acute attention to detail. And it’s this high-level of expertise and diligence that is mirrored in the hotel’s dedicated team of staff. Split into three distinguished hotels: Caesars Palace; Caesars Resort and The Residences at Caesars Palace, the new property has a total of 416 guest rooms, 80 hotel apartments and 79 suites. 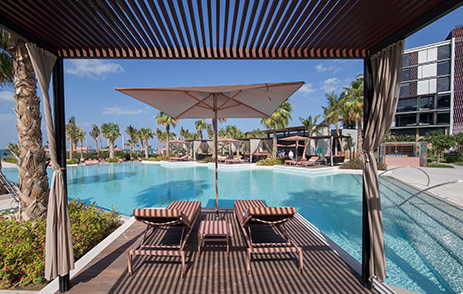 Caesars Palace is geared slightly more towards couples and adults and is where you’ll find Cove Beach – the resort’s beach club offering – and Qua Spa, a sumptuous sanctuary that’s fit for royalty. Caesars Resort on the other hand is perfect for families. Boasting a full-packed roster of entertainment for all ages, this hotel offers two swimming pools (one for families, the other for adults only), access to a private beach and a range of restaurants including signature restaurant with a Korean/American twist Paru and Bacchanal which serves a wide variety of decadent dishes. Talking of dining, in total Caesars Bluewaters Dubai is home to a whopping 12 restaurants and bars. Its most notable dining destination is HELL’S KITCHEN by Gordon Ramsay. 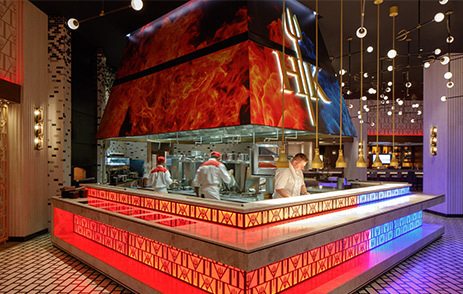 Bringing the flair and exciting show kitchens of its original Las Vegas location, this immersive dining experience is sure to be a top hit with guests. However, for Pan Asian delights with a contemporary twist and a menu of delicious hand-made dim sum, Zhen Wei is bound to whet your whistle. 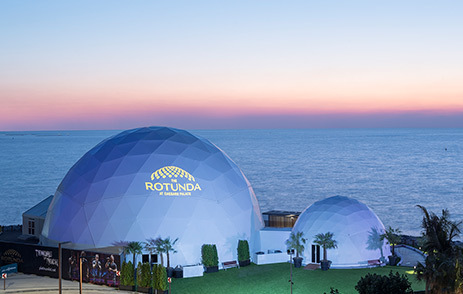 Bringing epic entertainment to the UAE with exciting packages, The Rotunda at Caesars Palace Bluewaters Dubai is a dedicated entertainment destination unlike anything the Middle East has seen before. Housed in a distinctive circular dome inspired by Rome’s famous Pantheon, the intimate 500-seat-360-degree viewing venue is a temple to awe-inspiring live acts and immersive shows. Guests can expect an electrifying roster of legendary headliners, trendsetting theatre acts, mind-blowing magicians and hilarious comedians. For the corporate guests, Caesars Forum is just the ticket. Comprising 10 luxury event spaces with endless possibilities, all your meeting, conferences and other event needs are sure to be exceeded here. Located within walking distance of the accommodation at Caesars Resort and Caesars Palace, it’s the ideal spot to host a gala dinner, quarterly board meeting or even a black-tie evening.